When you start to think about the muscles it takes to do everyday tasks it will start to blow your mind. When you have a child with hypotonia, you realize this every day. Simple things we do every day, like sitting, requires core and back strength, along with balance and coordination of muscles. It’s hard work! One of the goals of our therapy sessions is not to just reach milestones, but to avoid bad habits that can form due to hypotonia. There are a lot of bad habits that can happen with sitting, but when Noah sits nice and straight with his legs not in the splits, I see the payoff of all his hard work. Like I mentioned in the peek-a-boo post, the play of childhood helped us develop a lot of our muscles. I may not have realized what the swing set was doing for me when I spent countless hours playing on it as a child, but now I see it as a powerful developmental tool that help children learn to grow and develop.. Who knew. The reason Noah’s therapists use the slide is because when going down a slide you have to hold yourself up against gravity. 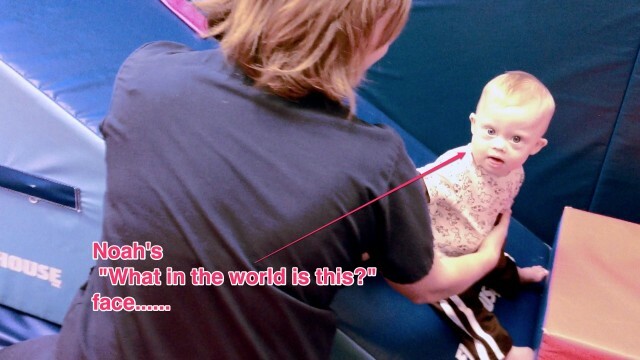 Not only that, but they stop him halfway down to help him engage those ab muscles, which in turn help him learn to sit up independently, and stay there. As usual, Noah’s abs continue to be stronger than mine. He rocked the slide, and I think that he probably had a little fun on his way down. What toys of your childhood have you found new uses for with your child? Thanks! He was like “what is this thing…” now he thinks it’s awesome. Haha. Great message for those who want to take recess away from kids, kids are still hard at “work” when they are using swings and slides! Great story, I will ask Aiden’s PT to try him with that. They use the exercise ball with him to develope his core. Awesome. Noah really likes the side. Let us know how it goes. I totally agree. How old is the child you take care of? Have any tips to share with us? Noah is just too cute,can’t get much cuter than that! Noah is such a little man… his expressions are priceless!!! love it… cant wait until little michael is this strong. We get closer and closer everyday!!! Noah, again, my inspiration!!! Be patient, it will come 🙂 Then you will look back and be blown away. I’m an ECE too and a Developmental Specialist- one of my clients has DS and she learned to go down the BIG slide this year! ( In September she’d get a quarter of the way down and be flat on her back.) We also love the trampoline- using a small one with a handle bar she learned to jump this winter- so now we can use the big one together instead of me just bouncing her around! And stairs- those pesky stairs. All that core strength helped her learn to walk up and down ( the much harder one) a huge flight of stairs all by herself! We’ve reached lots of goals this year with her core strength- just in time for her 4th Birthday! And we did it all through play! The small ones with the handlebar was the key for us! If we put her on a normal trampoline (big or small) she’d just wait for us to jump her. With the handle bar I was free to jump on my own on the floor to model, and she still had the stability to try it herself. Once she figured out the whole bend-knees-push-up bit she was unstoppable. Now she’s jumping all the time- independently! Play is powerful no matter our ability or our age. 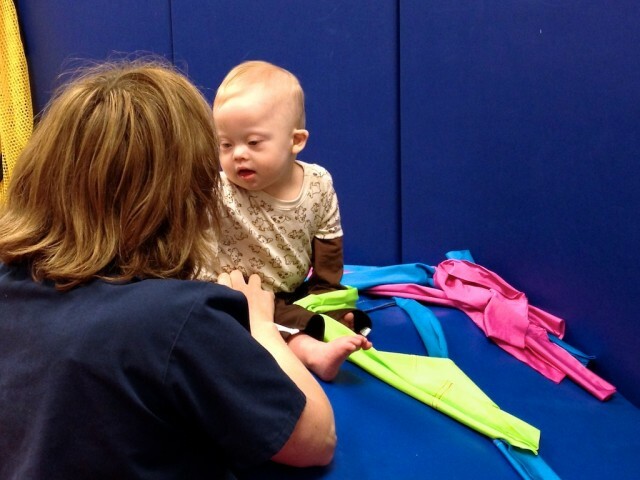 Thanks for providing a peek into Noah’s progress. I totally agree!!! Play is so important for everyone. Very cool! Let me know how it goes. I said to avoid bad habits 🙂 Thanks for looking out for me, I miss so many of my errors. I think you’re fabulous and Noah’s Dad dot com was probably the best site I have ever come across. I am learning so much and have your family to thank for that. Bright Blessings to you and yours, -Twig.